"This busy diva does not have time for a complicated side dish -- so out of my kitchen came these mashed sweet potatoes and pears. 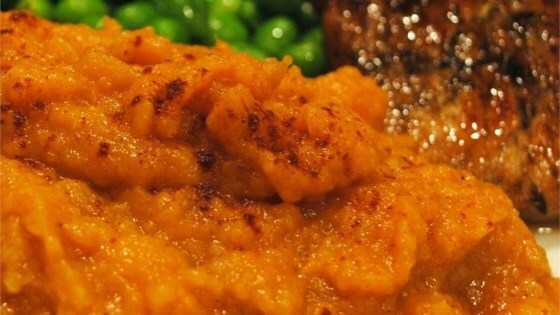 I may never make sweet potatoes any other way ever again." Place the pears, wine, and water in a small saucepan and bring to a boil over high heat. Turn heat to medium-low and simmer until pears are soft, about 5-10 minutes. Remove pears from wine and reserve. Place the sweet potatoes into a large pot and cover with water. Bring to a boil over high heat, then reduce heat to medium-low, cover, and simmer until tender, about 20 minutes. Drain and allow to potatoes to steam dry for a minute or two. Stir the reserved pears, evaporated milk, vanilla, brown sugar, butter, cinnamon, and nutmeg into the sweet potatoes and mash until smooth. Transfer to a serving dish and serve hot. I hate the taste of wine in anything. I substituted apple juice for the wine and it was beyond wonderful. A wonderful Thanksgiving addition. It was gone in seconds.